At Pro Football Focus, we grade every single player on every single play of every single game. With that, comes our grades for every player and ultimately rankings on our draft board for the draft every year. This season, we saw several prospects that we’re high on as a company not be selected for one reason or another. That being said, here are 10 players that were recently signed as undrafted free agents who we think will make an impact in one way or another with their new team in 2018. For even more information on these undrafted free agents and your team’s favorite new player from the draft, grab a copy of our 2018 NFL Draft Guide with expanded profiles, scouting reports, PFF signature stats and extensive details on over 300 players you cannot find anywhere else. 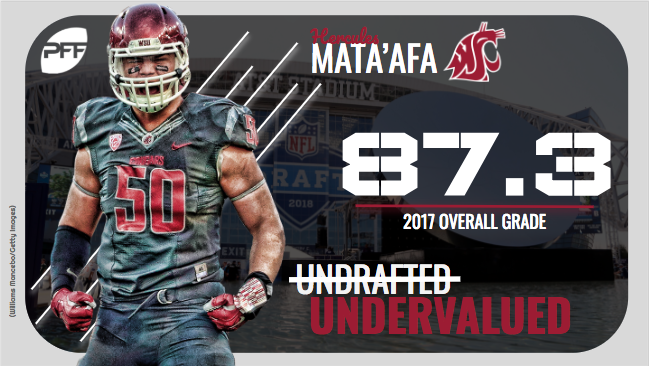 The root of former Washington State Hercules Mata’afa’s fall out of all seven rounds of the 2018 NFL Draft lies in his size, or lack thereof, and his inexperience at the position he’ll likely play in the NFL: edge defender. The 6-foot-2, 254-pound former Cougar played 1,399 (84.1 percent) of his defensive snaps either head up or inside of the tackles in his collegiate career, making him one of college football’s smallest interior defensive linemen for the past three seasons. Conversely, he played just 247 (14.8 percent) defensive snaps outside of the tackles. Mata’afa’s relentless motor and burst off the snap, however, allowed him to have significant success beating bigger offensive linemen at the FBS level. A product of outstanding bend and athleticism, he earned 80.9-plus overall grades in each of his three collegiate seasons, finishing his final year with the Cougars with a career-high 87.3 overall grade. Mata’afa’s motor has shown that there is no question Mata’afa will work his tail off to solidify himself as part of the Minnesota Vikings’ roster this season, and if head coach Mike Zimmer & Co. reward him for his efforts, they’ll have a high-upside project in their trenches. 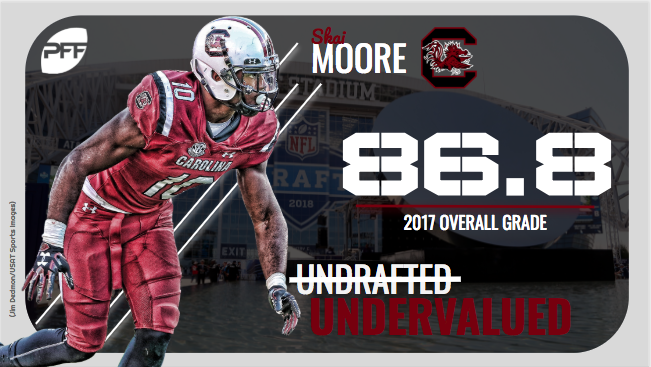 South Carolina’s Skai Moore, though lacking compared to the NFL’s standard height-to-weight ratio for linebackers, should be a valuable addition to the Indianapolis Colts’ defense given his premier coverage ability. Our fifth-ranked linebacker in the draft class, Moore earned an 88.9 coverage grade in 2015 and an 88.7 coverage grade in 2017, the latter of which edged the No. 8 overall pick in this draft, Chicago Bears linebacker Roquan Smith. The 6-foot-2, 226-pounder also allowed a passer rating of just 49.9 when targeted, ranking second among draft-eligible linebackers with at least 20 targeted passes in 2017. Moore’s injury history and tweener-type build are obvious reasons for concern, and his run-defense will need significant improvement if he’s going to be a three-down linebacker in the NFL. However, as a role player on passing downs, he can make a different for the Colts in 2018. Former Virginia safety Quin Blanding, a five-star recruit coming out of high school, has great size (6-foot-2, 207 pounds) for the position and can develop into an impact defender against the run at the next level. Blanding earned 82.3-plus run-defense grades in three of his four years with the Cavaliers. He also led all draft-eligible safeties in total run stops (29) this past season, proving himself to be a force as an in-the-box safety. While Blanding’s coverage grades haven’t followed suit throughout his career, he still has shown enough in terms of his ability to break on routes and make plays on the ball to have a role in this league. And with Su’a Cravens now off the roster, Blanding has a strong chance of working his way into a depth role with the Washington Redskins. 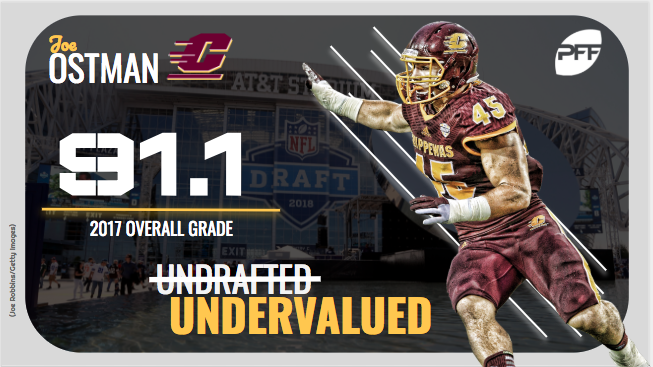 Standing at chiseled 6-foot-3, 255 pounds, former Central Michigan edge defender Joe Ostman plays with great balance and explosion, and his hand usage is some of the best in this class. Of course, being a bit leaner than some might like and hailing from a Group of 5 conference, he slipped out of the draft and landed with the Philadelphia Eagles as an undrafted free agent. While his small frame was a clear ailment to his run defense, Ostman took no prisoners in his pursuit to the quarterback. While recording an 89.8 pass-rush grade, he ranked No. 11 in pass-rush productivity (13.3) among qualifying edge defenders in 2017, racking up 31 hurries, nine QB hits and 14 sacks across 336 pass-rush snaps. As the Eagles proved a year ago, NFL defenses can’t have enough quality pass-rushers in their arsenal, and Ostman is exactly that. Former Alabama cornerback Levi Wallace (6-foot, 179 pounds; 4.62 40-yard dash) doesn’t have ideal measurables for the position at the next level, but his grades in his one year as a starter tell a different story. The former Crimson Tide walk-on played just 99 defensive snaps in his collegiate career before his senior campaign in Tuscaloosa. Despite his lack of experience, Wallace had exceptional coverage numbers across 782 defensive snaps in 2017. He ranked eighth among draft-eligible cornerbacks in passer rating allowed when targeted (44.3), allowing zero touchdowns and logging three interceptions in the process. He earned an 81.7 coverage grade for his efforts. 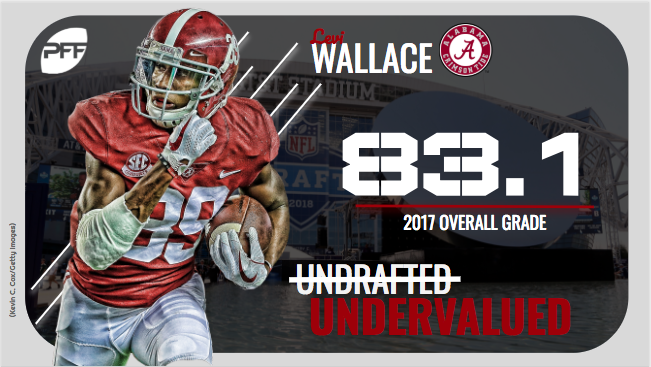 The fear of Wallace being a one-year wonder is valid, and his lack of size will cost if he isn’t able to bulk up any further. However, the former ‘no-star’ recruit is no stranger to doubts and uphill battles, and if he can mirror his 2017 play in camp, he should defy the odds once again. 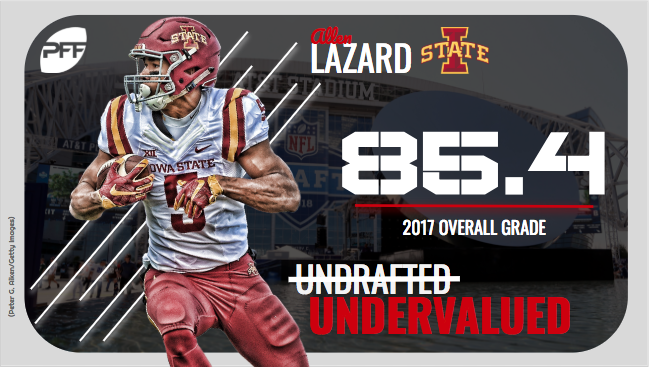 Measuring in at 6-foot-5, 227 pounds at the 2018 NFL Scouting Combine, former Iowa State wide receiver Allen Lazard is the typical possession receiver with elite production in contested situations and upside as a red zone threat. In addition to earning 85.4-plus overall grades in each of the past two seasons, Lazard caught 39.5 percent of his FBS-high 43 contested catch targets in 2017. Of course, Lazard’s game isn’t without the cons often attached to bigger possession receivers, as he lacks ideal short-area quickness and struggles to create after the catch. If he can continue to use his size and strength to his advantage against NFL competition, he’ll carve out a role as a big-bodied, mismatch weapon in the Jacksonville Jaguars’ offense. Former Iowa running back Akrum Wadley is a bit one-dimensional given his small stature (5-foot-10, 184 pounds) and underwhelming play between the tackles, but his potential as a pass-catcher is significant enough for him to make in impact early in his career. 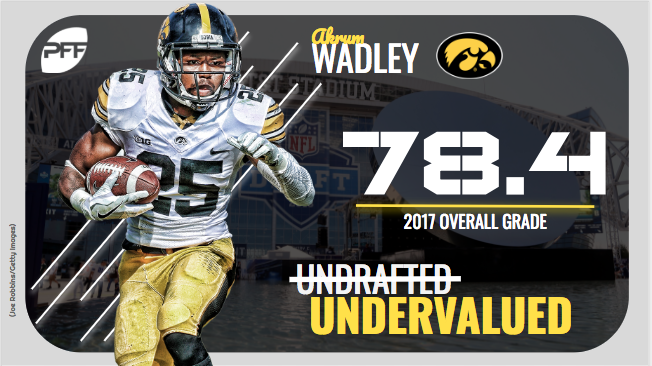 Wadley earned 81.7-plus receiving grades in each of his past two seasons with the Hawkeyes, leaning on his quick feet to turn short passes into long gains. In 2017, he averaged 1.61 yards gained per route run, ranking sixth among draft-eligible running backs with 20-plus targets. The Tennessee Titans may already have their go-to third-down back in Dion Lewis, but Wadley can step in as a key depth piece behind Lewis, especially if he improves in pass protection and flashes his pass-catching talents in camp. Like Wadley, former Texas interior defender Poona Ford is an impact performer in just one area on the game, as he is a block-eating monster against the run but struggles as a pass-rusher. Ford’s ox-like figure (5-foot-11, 303 pounds) pays dividends to his run-defense as a traditional nose tackle, as evidenced by his 88.4-plus run-defense grades in each of the past two seasons. While his lack of pass-rushing prowess keeps his ceiling low, Ford can undoubtedly find role in the Seattle Seahawks’ defense as an early-down run-stuffer. After deciding against drafting a quarterback through the first seven rounds, the Los Angeles Chargers brought in a former Texas Tech quarterback Nic Shimonek, our 11th-ranked signal-caller in the class, as an undrafted free agent. And despite his draft status, he has a strong chance to be much more than a camp arm. 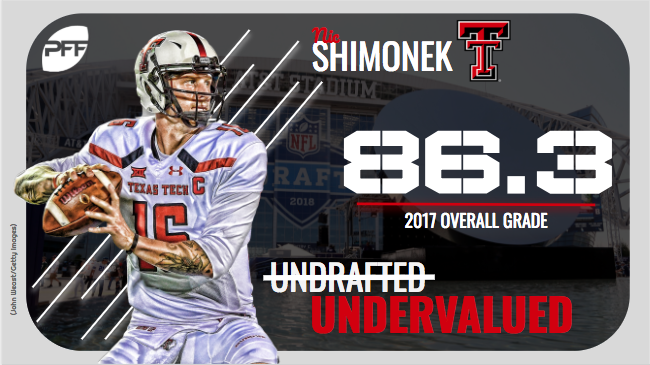 While Big-12 defenses may have inflated his collegiate production, Shimonek ranked inside the top-five among draft-eligible quarterbacks in overall adjusted completion percentage (771. ), adjusted completion percentage against the blitz (77.8) and deep-pass adjusted completion percentage (58.8) in 2017, metrics independent of defenses and rather more indicative of the quarterback individually. He also earned a career-high 86.3 overall grade this past season, ranking 18th among qualifying FBS quarterbacks. Former UTEP linebacker Alvin Jones, though against lower-level competition, put together three years of solid grades at the collegiate level, earning 80.7-plus overall grades in each of his past three seasons. He, however, is a bit one dimensional in that he takes on a more traditional approach to the linebacker position as strong run defender and run-of-the-mill coverage ‘backer. He ranked among the top-15 draft-eligible linebackers in run-stop percentage (12.1) in 2017. Behind veterans C.J. Mosley and Patrick Onwuasor, the Baltimore Ravens’ linebacking corps lacks key depth pieces, which could very well be Jones’ foot in the door. Jones should go toe-to-toe with former UCLA linebacker and Ravens fourth-rounder Kenny Young for reps all throughout training camp and the preseason.